Charlie Chaplin's 'A Night Out' is half an hour of the same sort of gag over and over again. Chaplin is drunk and together with another guy (Ben Turpin) he apparently is on a night out. They get kicked out of a bar, have some trouble with a waiter (Bud Jamison) there, his wife shows up as well to give us a little more fun, and out on the street a police officer is doing his rounds. 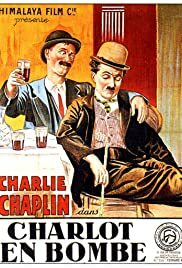 Basically we see Chaplin smack someone in the face, the waiter or the other guy, or even the waiter's wife, and then he gets smacked in the face. The physical action that follows is quite nice but after five minutes we get the joke, after watching 25 minutes more we are kind of tired of it. The reason to see this short, besides Chaplin's skill, is because Edna Purviance plays the wife of the waiter. This is her first film with Chaplin and that makes it a little more interesting. I squeeze it with a six (out of ten).